NEWFOUNDLAND: 1932 Transatlantic West to East PER DO-X: Attractive small format envelope franked the special Airmail stamp for the flight surcharged in red $1.50 on $1 deep blue (SG 221). 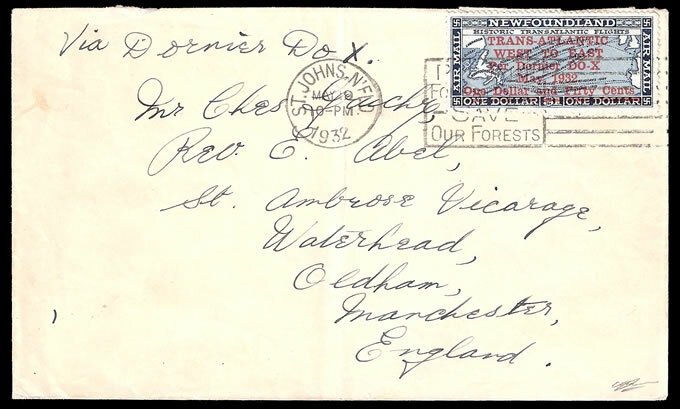 St Johns cds May 19 1932 (DAY OF ISSUE), addressed to England. Endorsed "Via Dornier DO X". Central fold, otherwise VF. Scarce piece.